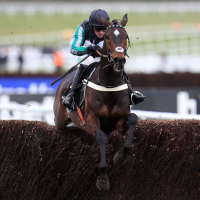 Altior claimed a dramatic renewal of the Betway Queen Mother Champion Chase at Cheltenham to remain unbeaten over jumps. In the process he was winning at the Festival for a third successive year in a third different race - but for a long way it did not look like it would be done quite in the manner many expected. The tacky ground prevented him from travelling with his usual fluency and only two days ago he was lame with a poultice on his foot. Coming down the hill it appeared Nico de Boinville was in deep trouble as Politologue, God's Own and Min were all seemingly going better. Altior showed the guts of a champion, though, and as De Boinville pulled him out, he clicked into overdrive. The even-money favourite then flew up his favourite hill to ultimately win in style from Min, providing Nicky Henderson with a record 60th winner at the Festival, with God's Own running well in the race yet again in third. The returning Douvan appeared to be enjoying himself on his first run since the same event 12 months ago, but he unfortunately fell before the race really began in earnest.